Sergio's a soccer star... in his dreams. He can't even kick the ball! So Sergio decides to try playing another position--goalie! He isn't so good at first, but with hard work and practice, he's ready for the game against the big, bad Seagulls. Will Sergio become a true star? This adorable "everypenguin" (Kirkus) returns with a story about determination and finding your true talents, leading to a triumphant and hilarious outcome. Edel Rodriguez was born in Havana, Cuba. He left for America on a boat with his parents and sister when he was 8 years old. His drawings and illustrations have appeared in four picture books, including Float Like a Butterfly and Oye, Celia!, on stamps for the U.S. Postal Service, The New Yorker, and posters for Broadway shows. Edel has also been an art director at TIME Magazine for over a decade. 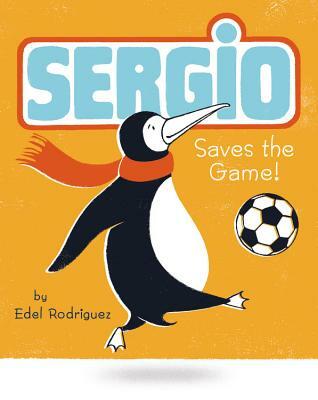 His first book with Little, Brown was Sergio Makes a Splash. He lives with his wife and daughter in New Jersey.